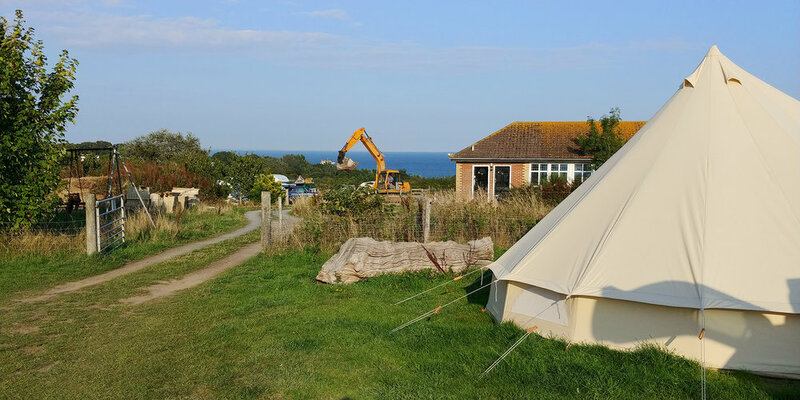 We spent the last week of the summer holidays camping in our beloved bell tent at Fakenham Farm, a tiny campsite on the Isle of Wight. We stayed for seven nights, our longest sojourn under canvas this far, and it was utterly blissful. 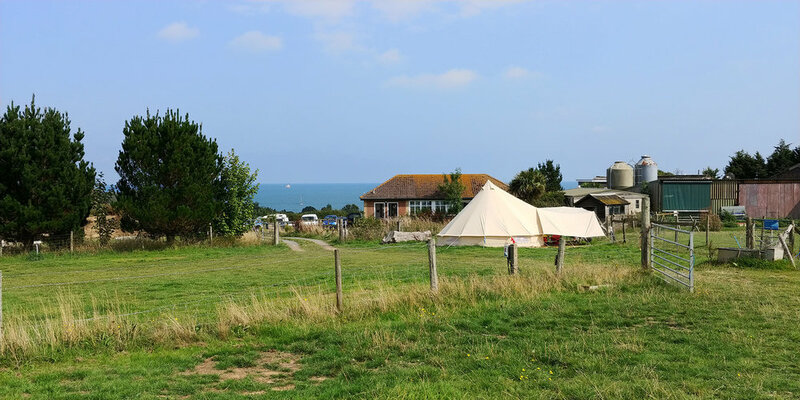 Fakenham Farm is a very small campsite set within a small farm just outside St Helen’s village, and a ten minute walk from St Helen’s Duver (the nearest beach). Now, if you want spotless facilities, a swimming pool, a club house and so on, I have to tell you - Fakenham Farm is probably not for you. If, on the other hand, you want wide open green spaces, sheep passing by a metre away from your tent, a glorious sea view, a few other campers dotted around in caravans, friendly owners who basically leave you to get on with it other than freezing your ice packs on request, and don’t mind sharing a single WC and shower, then you’ll love Fakenham Farm campsite as much as we did. A green field and farm buildings outside the tent. 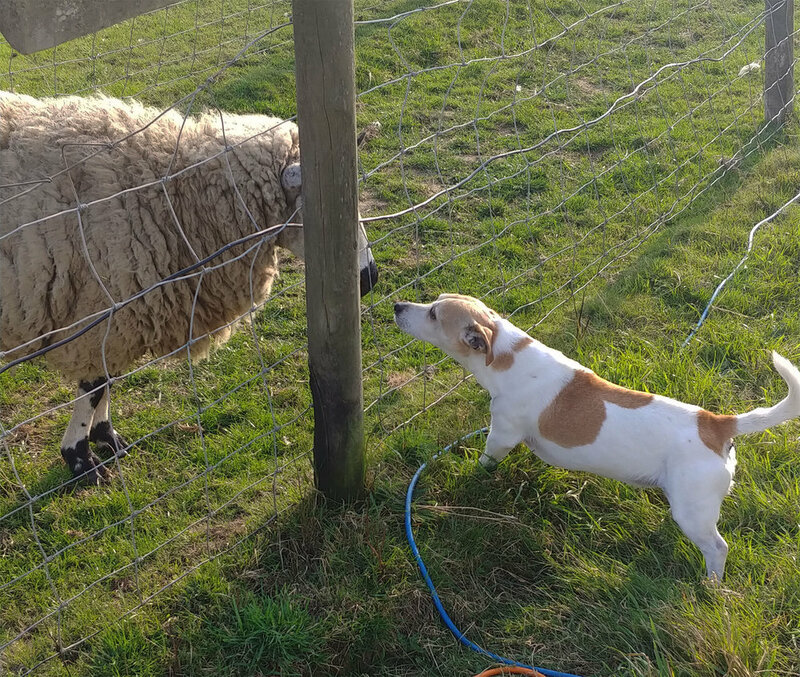 Penny versus sheep. The sheep literally couldn’t care less. Our biggest and smallest girl exploring the paths around the farm. You can see the point of our tent in the background. Big Mama pig and baby piglets during golden hour. The piglets routinely wriggled out from under their fence and romped around the fields with obvious glee. Big furry Rixy strollin’ around the field. Girls versus noisy Moses. The big one is wearing a crown cos it was her birthday. A large furry beast was discovered outside the tent, gnawing on an old tennis ball. There are also absolutely loads of random old cars and trucks in one of the fields. 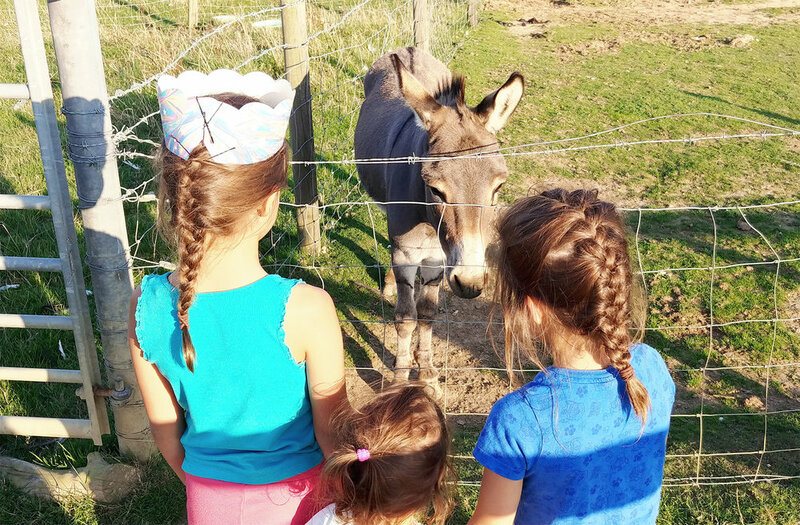 The kids loved roaming around peering into them. And also an occasional digger! This one wasn’t rusting in a corner, it was in active use for various farm-related manoeuvres. We managed to pack an absolutely tremendous amount of equipment into the car. Two adults, three kids, three dogs. 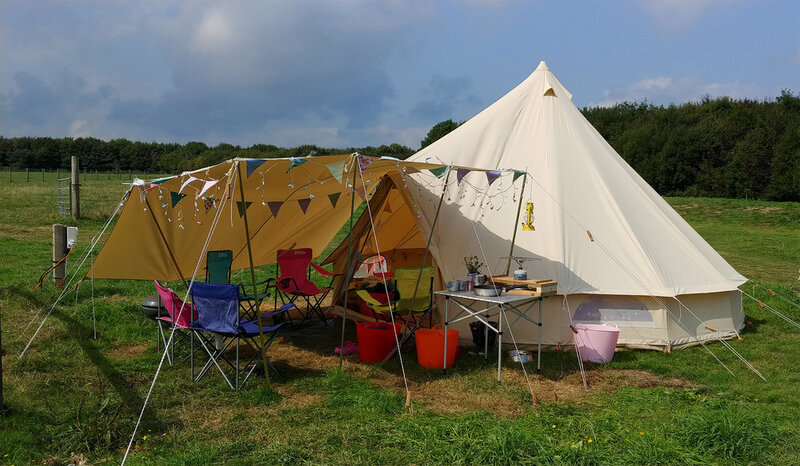 One large five metre tent with awning. Five chairs, four sleeping bags (one double), five sleeping mats. Two tables. Eight colourful plastic tubs. Ten metres of bunting, twenty metres of fairy lights, one stove, two belly baskets, two rugs, three duvets, seven pillows, one faux fur electric blanket, one baby Weber bbq, two wicker hampers, five sacks of clothes, four pairs of wellies (Andre is too relentlessly urban to wear wellies), four parkas, four anoraks, one sun tent, and one dog crate. Boom! My dad made us a brilliant wooden contraption to stabilise our Pocket Rocket stove. Wildflowers in gin tin vases :-) Plus a golden dinosaur egg, obviously. Rugs, blankets and flexi tubs inside the tent, along with a table covered by an antique tablecloth that belonged to my grandma. Two belly baskets and a cute spotty furry belly in a basket. 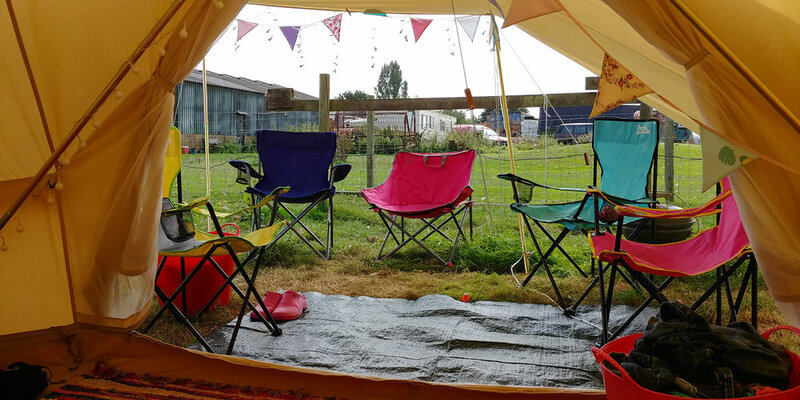 Having three over-excited dogs romping round and round a circular open plan tent isn’t always ideal, so we brought our crate with us for the smaller two to have some quiet time in. At night time we toasted marshmallows on the Weber, switched on the fairy lights, and snuggled up under the awning drinking gins in tins while the girls slept like sweet little exhausted possums all wrapped up warm and snug in their sleeping bags. I bought these outdoor fairy lights years ago in a Habitat sale, and they’re still going strong. Fakenham Farm has a lovely cafe on site called the Solent View Cafe. It gets mixed reviews on Tripadvisor, but we found it to be absolutely charming with a delicious menu and incredibly reasonable prices. 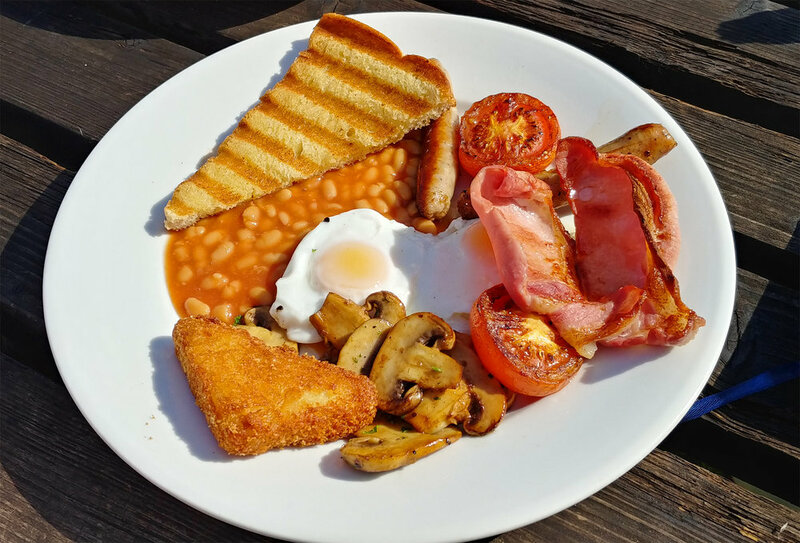 The best full English breakfast I have ever had in my life. The fried bread was an absolute taste sensation. Thoroughly recommended. 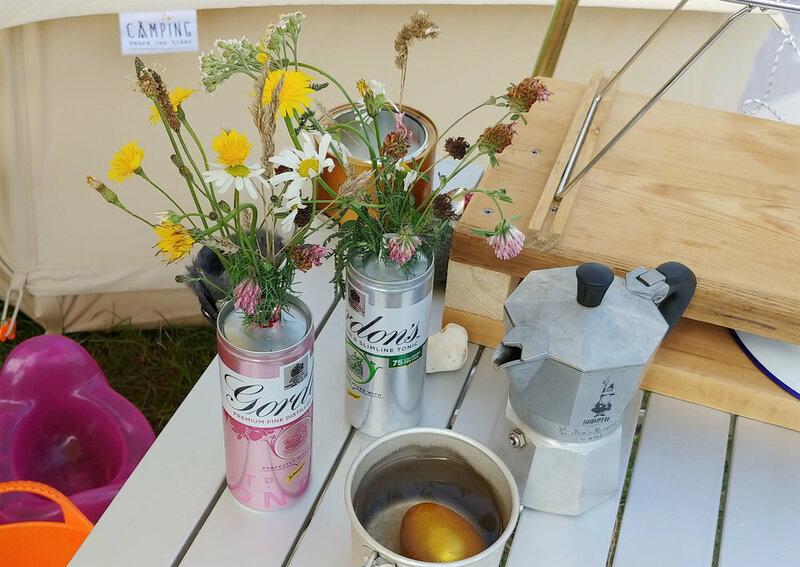 We didn’t eat at the cafe every day - cooking in your tent is part of the fun. After a few days of classic camping fare I could feel scurvy coming on, so bought a bag of spinach, wilted it in a pan, and ate the whole thing. Scurvy dodging at its finest. Frying eggs for breakfast, with the help of a naughty furry cleaner-upper. Flamingo bunting, floral garland made with artificial roses and silver birch branches, an antique mirror, and festoon fairy lights on the centre pole. Standard. 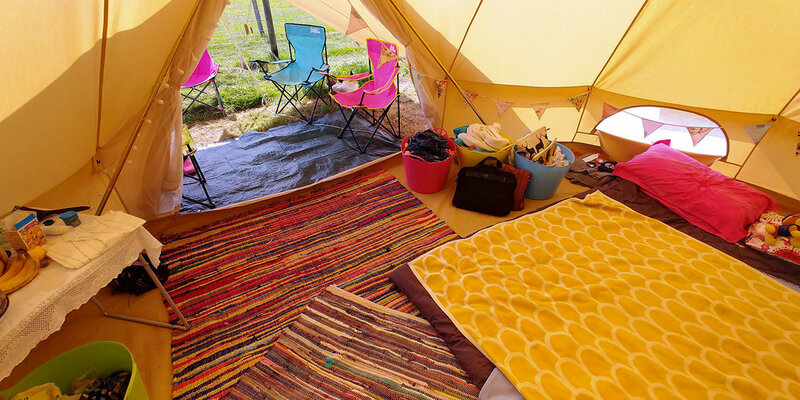 We absolutely loved camping at Fakenham Farm and will be back next year. The whole week cost just over £100 including electric hook-up, which is insane compared to how much we normally pay for a week in a cottage in Bembridge.